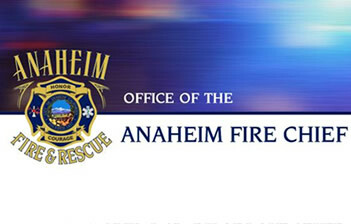 Beginning Monday, March 14, 2016, Anaheim Fire & Rescue will engage in wildland fire training to prepare for the approaching wildland fire season. This training will include the use of smoke canisters to assist firefighting personnel with locating the source of the fire. The smoke will be dispersed from cold smoke canisters that release white smoke. The smoke canisters pose no safety risk, but the smoke may be visible to residents in the surrounding area. March 14th, March 17th, March 18th, March 22nd, April 12th, and May 26, 2016.